‘Now is Then is Now’ is an essay commissioned for the book You Are Looking at Something That Never Occurred, published by the Zabludowicz Collection to coincide with its exhibition of the same name in London, 30 March – 9 July 2017. You Are Looking at Something That Never Occurred brings together 14 international artists who work with photography. It spans a 40-year period, from 1977 to the present day, and traces how artists have used the camera to blur boundaries between past and present, fact and fiction. Today, the photographic image feels ever-present, perhaps even over-familiar. How then do artists go about producing works that can engage us? In this exhibition the recognisable world of images is used as a starting point. The languages of the personal snapshot, advertising and cinema are reworked to produce new pictures. The exhibition title is borrowed from a conversation between Jeff Wall and Lucas Blalock in which they argue for art that is experimental and mysterious. Surfacing from beyond our everyday reality, the works presented here question an instant and truthful depiction of the world as proposed by the ‘decisive moment’ of street photography. Instead they embrace slower methods of picture-making. Three main strategies recur: the appropriation of existing images and objects, the staging of new situations, and digital manipulation. Drawn exclusively from the Zabludowicz Collection, this exhibition highlights connections and points of divergence between artists of different generations. It focuses on key sites of photographic enquiry in North America and Germany, and maps how the medium has developed into a vital component of contemporary art. 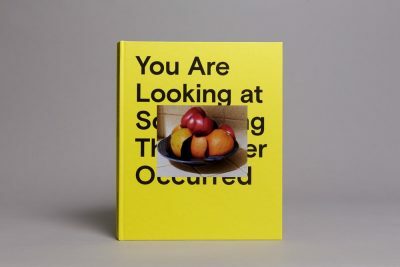 A new full-colour publication accompanies the exhibition. Alongside images of works from the exhibition, it includes a commissioned essay from David Campany, a round-table discussion moderated by artist and writer Chris Wiley featuring Lucas Blalock. Sara Cwynar and Erin Shirreff, and a text by exhibition curator Paul Luckraft. The earliest of the images gathered for You Are Looking at Something That Never Occurred are around forty years old. It was in 1977 that the artist Richard Prince began to photograph and enlarge details from the advertising pages of consumer magazines, while Cindy Sherman was beginning to photograph herself as if she were fictional characters in remembered movies. Re-photography, postmodern photography, appropriation art, dissimulation: several descriptions were given to the strategies of Prince, Sherman and the many artists of what came to be called the Pictures Generation. And while those terms might conjure up a particular period or specific turn in the role of photography in art, much of the art itself can still seem disarmingly fresh. Contemporary, even. Although the intervening years have brought major transformations in the production and circulation of images – notably digital photography and the internet – such art from the later 1970s does not appear to belong to an era so different from our own. In many ways, it anticipated the present moment. But if, in 1977, you were to have looked back four decades to the photographic art of 1937, would the differences have been far more stark? Was history beginning to come to an end in the late 1970s, as implied by so many of the early commentators on postmodern art and society? Was time slowing to a standstill? And if that work does still feel contemporary, is it because art and society are stuck? Not exactly, although feelings of déjà vu are inescapable. Many of the central challenges facing artists today would be entirely recognisable to those artists of 1977. Whatever else it does, You Are Looking at Something That Never Occurred charts the spiralling persistence of interest shown by artists in the ‘image world’, that nebulous, seductive and repellent archive that has been growing constantly in the mind, in popular culture and in informal archives. This interest first emerged around a century ago, in the Dadaist collages of printed matter, and in early Cubism’s use of scraps of mass media ephemera, such as news clippings. (Indeed, the contemporary worry that we live in a flood tide of images was first voiced in the 1920s and 1930s, notably in the writings of Siegfried Kracauer and Walter Benjamin. It’s not a new phenomenon.) That interest mutated into the Surrealists’ subversion of the authoritative photographic document and their undermining of the glamour portrait, then into the Situationists’ détournements of popular spectacle and Pop Art’s equivocations with consumerism and celebrity. In the Conceptual Art of the late 1960s and early 1970s the engagement with non-art images shifted yet again to the estrangement of common photographic protocols: the collection, image-text relations, the snapshot, and so forth. Whether intuitive or calculated the art that followed, typified by Prince and Sherman, seemed to internalise all of that art history, reworking signs and symbols in ways with which each of those movements would have been able to identify. There’s a distinct line to be traced back from Sherman’s imaging of fictive female personae to the interwar photography of Claude Cahun and the media montages of Hannah Höch. Prince’s sly take on advertising runs back to Marcel Duchamp, via Andy Warhol and Guy Debord. Those lines go forward too, and they are mapped out quite clearly by You Are Looking at Something That Never Occurred. However, where Dada, Surrealism, Situationism, Pop and Conceptual Art reconfigured the popular imagery of their own moments, the artists in the present exhibition face the quandary of what the contemporary really means. In an era of unprecedented access to the past, what is now? To be sure, some of the more recent works, for example those by Lucas Blalock, explore specifically digital matters that were not present in 1977. Nevertheless, Blalock’s mise-en-scènes (his colour palette, the calculated gaucheness of his still life arrangements) conjure a generalised not-quite-now of consumer culture. Elad Lassry makes similar slippages, with motifs and treatments that reimagine some just forgotten mail-order catalogue, or out-of-date greetings card. Sara Cwynar’s Soft Film 2016 Anne Collier’s reworking of sunsets and vinyl record sleeves really could have been made at any point since the 1970s. Erin Shirreff’s silent movie Roden Crater 2009, made by slowly cross-fading printouts of internet images of the extinct Arizona volcano, feels like a hybrid of Prince’s early work and a lost film by Stan Brakhage from around 1972. With her series of Hidden Poems works, started in 2010, Natalie Czech photographs pages of publications upon which she has highlighted words to reveal poems by Frank O’Hara, Jack Kerouac and others, but her raw material includes old copies of Life magazine, which ceased full publication in 1972, along with art catalogues – one of which even includes a reproduction of a Prince re-photograph of a Marlboro cigarette advert. To risk an oxymoron, might this doubt about the particularity of the present be precisely what distinguishes these works from their antecedents, precisely what does make them contemporary? If artistic time has stood still it is partly because the past, or at least the volume of images from the past, now weighs upon the imagination as never before. For most of the twentieth century, artistic modernism could push on at its famously breathless pace because the past could be so easily ignored or forgotten, or was never even known. Illustrated catalogues were few and far between, museums were far less plentiful, magazines came and went. A great deal of modern progress was built on erasure and ignorance. And we may note just how many of the recent survey exhibitions about the art of the last century have been motivated by discoveries of precedents and parallels that ask us to rethink what we thought we knew. Today the twentieth century and its various modernisms are being archived in unimaginable detail, and those archives and are mined, revisited and recuperated. It is rescued, brought back from near oblivion, like an old negative dusted off, digitally scanned and repurposed. Blessed and cursed by the internet, we are faced with the task of making sense of the enormity of the last century – its achievements, its failures and its blind spots. A corollary task, which is only just beginning to be contemplated, is to figure out how to move onwards, not by ignoring the past (for you cannot unring a bell) but by coming to terms with its lessons. Through the individual works gathered in You Are Looking at Something That Never Occurred, we can glimpse something of these tasks, or at least some symptoms of them. At first glance, the exception to this legacy might be the work of the Canadian photographer Jeff Wall. In 1977 (yes, that year again) Wall began to make singular, large-scale tableau photographs. (The Germans Thomas Ruff and Andreas Gursky followed a little later, although these two entered the image world’s hall of mirrors soon enough, Ruff with his mimicry of the anonymous passport photo and his blow-ups of low resolution internet JPEGs, Gursky in his exploration of the spatially flattened digital composite.) Wall’s work appeared to embody a very different attitude, one that connected with a longer history of the picture. Indeed, Wall has understood the term ‘Picture’ in a very different way from the Pictures Generation. For him, the Picture is the exemplary canonical art form. It belongs not to the base popular culture that proliferated in the twentieth century, but to the classical picture gallery, and it can be traced back through the history of Western painting. In the early part of the twentieth century the picture gallery was transformed and displaced by the modern ‘white cube’, the supposedly transcendental space set aside from the pressing chaos of modern life and mass culture. But as soon as this transformation was under way, artists began to incorporate the imagery of mass culture into their work. They relied on the white cube to dramatise their transgression. Art that borrows non-art imagery plays strategically upon the idea of not quite belonging in the modern gallery, inhabiting it only with irony and distance, inviting spectres of the magazine page and the movie screen into the exhibition space. Nevertheless, this space is pivotal to the reception of such art. Works that engage with the reproduction of mass media forms find their most powerful expression in the one cultural arena that privileges originality and the singular object. This important lesson was developed in the Pop exhibitions of Robert Rauschenberg and Warhol, where art received its scandalous charge not just from the enlargement of Pop-cultural material, but from the sheer fact of being exhibited at all. Today, of course, that sense of scandal has dissipated, and the artist’s appropriation of mass media iconography is today almost as venerable as oil painting. If any scandal remains it is the waning of affect that comes when there is so little difference between mass culture and the art culture that appropriates it. Jeff Wall made a very different bid for the specificity of the gallery encounter, since his life-scale photographs in backlit light boxes invited a form of beholding and spectatorship that required it. Where photographic modernism from the 1920s to the 1970s had occupied the gallery and printed page almost interchangeably (as many of its achievements were books as exhibitions), Wall put forward a sovereign claim for the exhibited photograph. While his images do reproduce on the page, they belong to the gallery. It has often been argued that photography in art is split between the exemplary composition that respects the pictorial practices of the past and the mediated culture of the copy. Or think of it as the pictorial and the anti-pictorial, the classical ‘maker’ and the ‘bricoleur’, or even the ‘photographer’ and the ‘artist using photography’ – a distinction that really took hold in the 1970s. But are the differences really so clear-cut? In You Are Looking at Something That Never Occurred, Wall is represented by Still Creek 2005, a photograph showing a stream emerging from a man-made tunnel in a thickly forested gully. It is a gentle image of compromise between nature and the modern world. On an immediate level, nothing could be further from an art of quotation and copy. However, Wall was photographing the very same location where in 1989 he had staged his dramatic night-time tableau, The Drain. In this earlier image two adolescent girls enact, rather archly, some mysterious ritual, and what we see could be a fragment from an updated fairy tale or allegory. The girls are in that wooded space, at night, but in being so artificially illuminated they feel ‘planted’ too, like figures in the painter Edouard Manet’s more forthright provocations (think of the social cyphers in Fishing 1862, or the more well-known Olympia and Le déjeuner sur l’herbe, both 1863). What prompted Wall to return to that location? Was it a shift in interest from the representation of drama to the drama of representation itself? A feeling that the setting was as significant as any performance within it? A preference for day over night? A realisation that the place hadn’t changed much in the intervening sixteen years? Was Wall reworking his established field, as all artists do? We cannot know. But Still Creek is a remake, of sorts. In a 1996 essay on Wall’s work, the critic Thierry de Duve looked at The Drain and asked the reader/viewer to imagine it without the girls. Remove them and the picture becomes a different kind of treatise on photographic representation, its illusion of depth undercut by the flat black void of the tunnel that blots out the natural position of the vanishing point. To make Still Creek, Wall has stepped back a little, but the sense remains that the space before the camera is a natural instance of the space of the camera itself: a shrouded arena pierced by a black opening. Still Creek is as much a photograph about representation as any work of appropriation art. And yet, this does not preclude Still Creek from being a document of what was before Wall’s camera, just as Prince’s photographs are records of what was before his. Photography is only around 180 years old. For quite a while this newness was its calling card. It was not burdened by art historical baggage. It could throw off the past while recording the present as never before. It could embody the now and forge new paths. But just as news archives began to groan under the weight of photographic documents, so photographic art has had to come to terms with its burgeoning past. This medium now has a history as complex as any other. And part of growing up is bound to entail getting used to looking backwards in order to move forwards. See, for example, Jean-François Lyotard, The Postmodern Condition (1979), Manchester University Press, 1984. See, for example, Siegfried Kracauer, ‘Photography’ (1927), Critical Inquiry, Vol. 19, No. 3 (Spring, 1993); and Walter Benjamin, ‘The Work of Art in the Age of Mechanical Reproduction’ (1936), in Illuminations, Random House, 2002. See, for example, Michael Fried’s book Why Photography Matters as Art as Never Before (Yale University Press, 2008) and Jean-Francois Chevrier’s 1989 essay, ‘The Adventures of the Tableau Form in the History of Photography’, in Douglas Fogle ed., The Last Picture Show: Artists Using Photography 1960-1982 (Walker Art Centre, 2003). Fried and Chevrier have both written extensively on the work of Jeff Wall. Thierry de Duve, ‘The Mainstream and the Crooked Path’, in de Duve et al., Jeff Wall, Phaidon, 1996.